Two bedroom apartment in Fuerteventura (Canary Islands) in the heart of Caleta de Fuste has living room-kitchen with two terraces, where you can enjoy a nice meal, bathroom, two double bedrooms one with a double bed and the other with two beds , each with its terrace, fully furnished, can accommodate four people. It is located in a very familiar complex and where tranquility is breathed. You can enjoy the pool of the complex and if you want the white sand beach is 100 meters from the place. They will be able to enjoy an ideal place for relaxation. You will find all kinds of restaurants, shopping centers, coffee shops, thalassotherapy breweries ... You can enjoy the nightlife of the area if you wish. I encourage you to taste our wrinkled potatoes and our mojo picón. The island has many treasures to offer so that visitors discover our customs and our history, they will not regret visiting us. Very close to the accommodation there is public transport or rent a car if you wish. This place is special because of its golden sand beach, the tranquility that is breathed and the kindness of its people. An unforgettable rest. 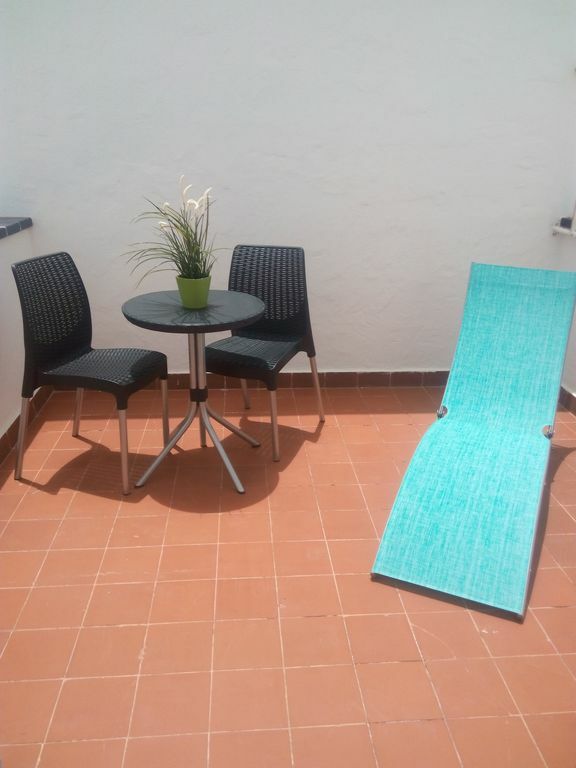 Lovely spacious apartment situated in the heart of Caleta, everything in the resort within a few minutes walk in any direction. The owners from the first request for booking to arriving were very pleasant and easy to deal with. The apartment was clean and nicely furnished and also benefited from having 4 terraces, giving you the choice to spend a lazy day following the sun at the apartment. The owners met us on arrival. The apartment had all the necessities for your holiday, including towels, extra bed linen, some toiletries, hairdryer, etc. They also kindly left a bottle of water and wine! We hope we are able to arrange another stay here soon. It has been a pleasure to have you with us. We hope to see you again soon. Thank you for choosing us for your vacation. The apartment was spacious and having 4 terraces enabled us to get sun or shade as we wanted it. The main bedroom is very hot so a fan is necessary. Everything you might need for your stay is provided. Free WiFi was great. Very comfortable and homely. There are many excellent bars and restaurants in every direction, beach is very close although the pool was a welcome asset as it was so hot. Excellent value for money! It has been a pleasure to have you in our house. No one has ever asked us for a fan for the main room, we will take it into account. Lovely apartment in a perfect location close to shops, bars and the beach. Very spacious with 4 separate balconies so you could have sun all day long. A lovely holiday! Thank you very much Elaine, I am glad you have had a wonderful vacation, I hope to see you again soon. a greeting. On arrival we were met by the owner who was very nice and helpful, she took us to a upstairs apartment. We were left a bottle of wine and water. The apartment was very well equipped with a large fridge freezer, Washing machine, Microwave, Kettle, Toaster, Sandwich maker, a two ring hob, Flat screen tv , no English channels, Very good wifi, Hairdryer, extra bedding if needed. there is no safe in the apartment. The beds were very comfortable, overall we found the apartment to be very clean and comfortable. The swimming pool is back down the steps which you were given a key for access. We would highly recommend this apartment to any one as it is situated in the town centre opposite the Barceló Hotel. Rocky and Lynn. Thank you very much Paul for your comment it has been a pleasure to have you in our house we hope to see you again. fabulous property well situated in the centre of Caleta. This is a quiet complex of apartments in close proximity to all of the central attractions of Caleta. the apartment is well equipped with everything you would need on a self catering basis, although the resort has enough restaurants and bars to save you cooking for a month. the furnishings are tasteful and the apartment is spotless. With a terrace of both bedrooms, the living area as well as the entrance it pretty much gets sun all day round if you choose to stay at the premises during the day. we really enjoyed staying here and would definitely do so again. this is our 7th stay in Caleta and our favourite property to date. Thank you very much Elizabeth, it has been a pleasure to have you in our house. We hope to see you again. No se permiten fiestas ni mascotas y deben respetar el descanso del resto de personas que viven en el complejo. Hacernos saber la hora de su llegada con antelación. Por lo demás que disfruten de mi casa como si se tratase de la suya.